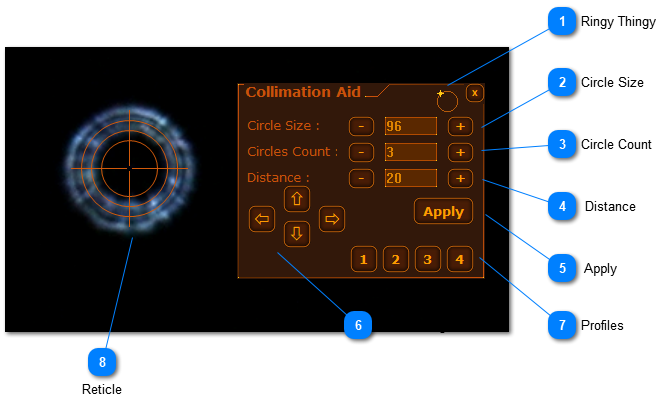 The Collimation Aid is accessible from Tools tab. The Collimation Aid is used to create and place a reticle over LiveView or image in order to inspect and tune the telescope collimation. Define the pattern for the reticle and simply drag it to the place of the diffraction rings. The using the fine moving buttons you can adjust the position with pixel resolution. The aid allows store up to four predefined reticles. Ringy Thingy is an innovative way to edit numeric values using only mouse or touch pad. See details and animation how to use it in the Application Interface notes. Defines the diameter of the most outer circle. Defines the count of the inner circles. Defines the distance between the circles starting from the most outer circle. Applies the entered reticle changes in the size, count and distance. Use it when you have changed the values without the +/- buttons. Moves the reticle with one pixel step in the desired direction. Use Shift+Click to save the current size, count and distance on the wanted position. To load saved profile just click on a number. This is how the reticle looks applied over an image.